It’s a well-known fact here on TMP that I adore Cary Grant. He’s one of my absolute favorite actors and tops my list of classic Hollywood crushes. 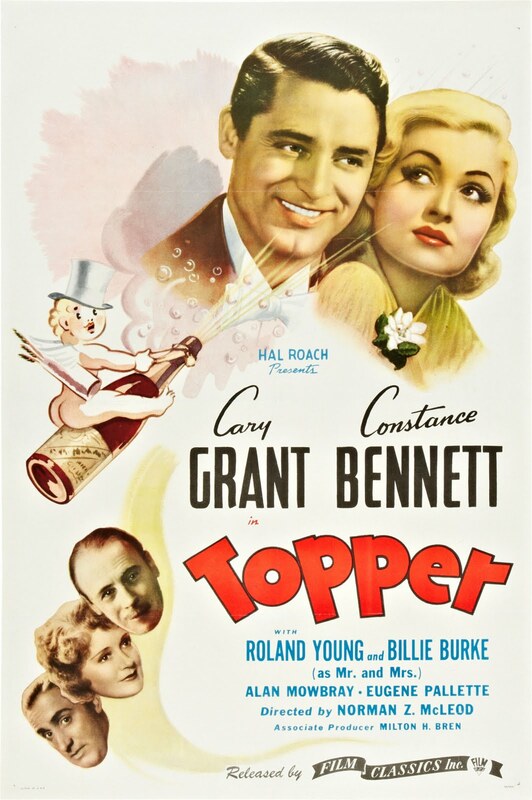 Topper was one of the first Cary Grant films that I fell in love with, and to this day, after many years of re-watching, it remains in my top five from his filmography. It’s one of the most delightful films to emerge from the comedy genre in the ’30s. Topper tells the tale of George and Marion Kerby, a gorgeous and rich young couple who put fun above all else, including their responsibilities. George is a banker, but only attends one corporate meeting each year, not getting much work done otherwise. On the way home from the latest meeting, George and Marion lose control of their car, hitting a tree. Sadly, the Kerbys are both killed in the accident… but luckily, they get the chance to live on for a little while, as ghosts. They’ve been made ghosts because they haven’t done enough good or bad to get into heaven or hell, so they decide to haunt Cosmo Topper, an uptight banker from George’s former workplace. They hope to do a good deed and end their limbo by spicing up Mr. Topper’s usually-orderly life. Topper succeeds in winning the viewer over with its charming cast, quick pace, and fantasy-laced story. The performers all have great chemistry and seem to be having just as much fun playing these characters as the viewer has while watching them! Picture Play magazine shared an odd behind-the-scenes tidbit: “Constance Bennett, who is usually so elegant, startled everyone on the Topper set by chewing gum persistently. ‘I’m cutting down on smoking,’ she explained, sort of between cuds” (from the August 1937 issue). A few months later, in the November 1937 issue, the mag finally reviewed the film itself rather than its leading lady’s gum-chewing habits. Norbert Lusk described Topper as “a witty, whimsical oddity” and “clever as clever can be.” And with that, I have to agree! Surprisingly, I had a hard time with this one (the movie, not your review!). Even though I’m a fan of Cary Grant like yourself (just not at ‘crush’ level, however), I thought he and the others were just so obnoxious and, at times, irritating! Who knows, maybe I was having a bad day when I first saw this…perhaps another viewing is in order. And Constance Bennett chewing gum? Heavens! Ha! I knew you wouldn’t like my feedback on that one! But I think you’re right: I was watching this movie as if I was dealing with these people in real life, instead of treating it as a screwball fantasy. But still, I’d have to say my choice for go-to Grant would be ‘My Favorite Wife’. ‘My Favorite Wife’ is one we can definitely agree on. That’s another top fiver for me from Grant’s filmography. Previous Previous post: Make room on the mantelpiece — ANOTHER Liebster Award for TMP!